Your guide on where to live in Hamilton, Ontario. Like major cities around the world, Hamilton neighbourhoods have developed distinctly different ambiances and amenities. When considering where to live in Hamilton, it is important to think about factors beyond the house or apartment itself. Are you looking for a bustling urban environment with plenty of restaurants and shops steps from your door? Or are you hoping for a quieter community feel? Questions like these are key to ensuring you find the quality of life you expect from your new home. This Hamilton Neighbourhoods Guide aims to give you a bit of background on various areas in Hamilton, to help your decision of where to live. For more articles and tips, check out the complete Moving2Canada Hamilton City Guide. Many neighbourhoods in Hamilton huddle around a main street of shops and restaurants, with residential streets branching off. This format is attractive to many; it is possible to find well-proportioned family or starter homes with off-street parking and gardens, steps away from grocery stores and other amenities. Ottawa Street is one such neighbourhood. Recently named as the best place to buy property in Hamilton, the average home price in 2017 was just over $330,000. Houses in this area are typically three-storey (including a basement) with two or more bedrooms, parking spaces, and period features such as bay windows and red brick. In addition, the nearby Ottawa Street itself is increasingly popular as a gallery and art spot. Its status as a Business Improvement Area means there is continued investment in public amenities, so there are some lovely benches and flowerbeds too. This is one of the original downtown Hamilton neighbourhoods and, as such, has an authentic historic feel. Home to the Hamilton GO station, it is also well connected to public transport and walking distance from the downtown core of malls and businesses. Several new-build high-rises in Corktown provide apartments alongside older historic homes, and there is a definite atmosphere of being in the centre of a large city. House prices are higher than elsewhere in Hamilton but still reasonable in comparison with other cities, with a 2017 average of around $348,000. Next to McMaster University, this residential neighbourhood has the distinct atmosphere of any university-adjacent neighbourhood – lively, quirky, and at times rowdy. But ongoing mediation and collaboration between McMaster and neighbourhood associations has ensured that the area remains comfortable for all residents. Professors and university staff also favour the area, so while many houses are rented out to students, Westdale is also home to many young families and professionals. The central Westdale Village shopping area is a favourite with locals, cultivating true small-town feel away from Hamilton’s downtown. Westdale is a good starting point if you are looking to rent or share a house, as the large student population means there may be more renting options than other areas. 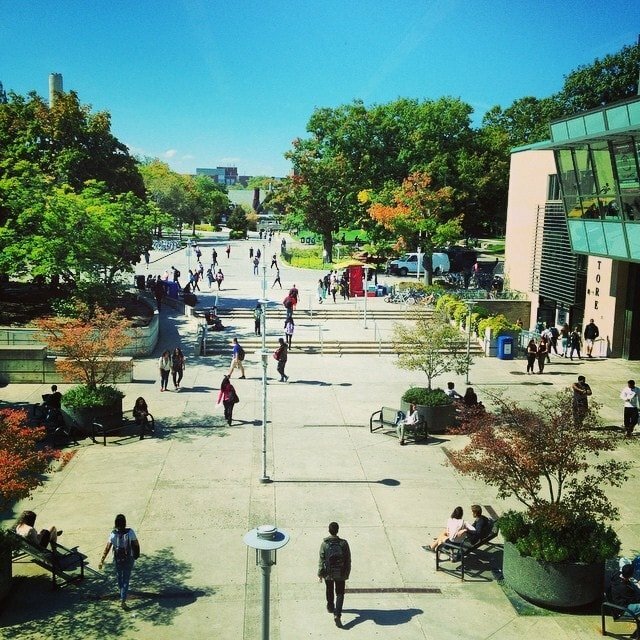 McMaster University is at the edge of Westdale, one of the more desirable Hamilton neighbourhoods. Stretching from downtown to the lakeshore, this neighbourhood is a mix of apartment buildings, family homes, and businesses. It is well-connected to public transport with the West Harbour GO station, and is popular with locals and visitors alike for the the amenities of the Lakeshore and Hamilton Beach. While the area is improving, the collapse of Hamilton’s industry in the 80s and 90s had a lasting effect on the Northend and surrounding Hamilton neighbourhoods such as Beasley, as well as the industrial sectors to the east along the lakeshore – but there are some decent property prices as a result. 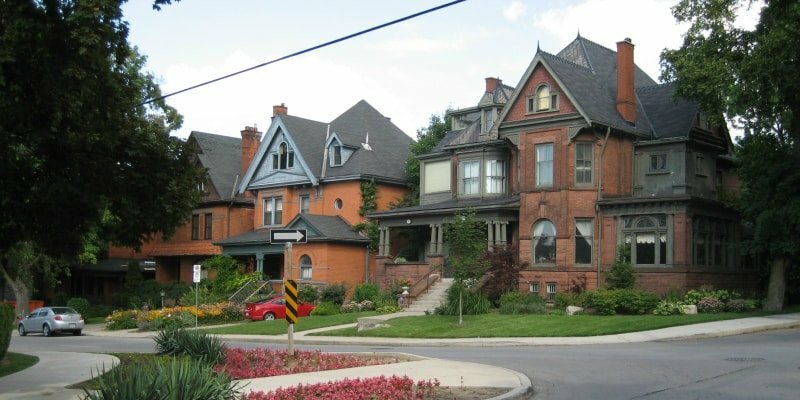 Hamilton’s East End is a larger area stretching from Gage Park to the waterfront, and containing several individual neighbourhoods (Historic Hamilton notes 21 different neighbourhoods within its boundaries!). Traditionally home to workers who lived close to the factories, the East End is characterised by wide, suburban-feeling streets lined with mid-century bungalows and small homes. This is a good place to look if you want some garden space and if you do not mind driving for daily necessities. Shops and restaurants can be sparse, however, as are public transport links. This broad swathe of the mountain bordering Hamilton to the south is separated into several smaller neighbourhoods. Largely residential, it is possible to find cheaper homes here than downtown – but some of Hamilton’s most lavish and expensive real estate can also be found right at the top of the mountain, on the Mountain Brow. Lower stretches of the mountain were popular in the 70s and 80s when everyone wanted to live outside the city because the downtown was suffering from economic and industrial collapse. However, as the downtown has revitalized in recent years, Hamiltonians are increasingly staying around the city’s core and, as a result, some of the suburban areas are now in decline. Make sure to visit any property you are considering before renting or buying in the area. Hamilton offers downtown apartment living and leafy suburbs in near-equal measure. This scene is from Aberdeen Avenue. In 2001, several neighbouring towns were amalgamated into the City of Hamilton. These nearby towns are worth considering if you are looking to buy a home. While driving may become a necessity for even the smallest tasks, the small-town community atmosphere of these smaller towns is an attractive draw for many. Moreover, as these Hamilton neighbourhoods existed as towns, many have all the amenities you would need on a daily basis without needing to go downtown. Here is an overview of just a few. Over the past few years, Dundas has become noted for a boom in the quality and variety of its shops and restaurants that has made it a destination for out-of-towners. Several of Toronto’s hipster trends have taken the town by storm in recent years; an old school house was recently renovated into lofts, and a microbrewery, artisanal butcher, and third-wave cafe are just some of the relatively new additions to its high street. House prices in central Dundas are rising, but larger houses in the suburbs (yes, suburbs also have suburbs in Ontario) can be found for around the same price as a small (yet ridiculously quaint) historic clapboard house in the centre. Nestled on the lakeshore east of Hamilton, this small community still carries a strong identity from its former status as an independent town before its merger with Hamilton. With a recent census showing that over a quarter of its population was born outside of Canada, many newcomers to Canada have found a successful new home here. Waterfront condominium or “condo” developments have sprung up in recent years, as a property boom seeks to lure commuters in particular to a well-connected area with a more affordable cost of living than Toronto. Stoney Creek’s position on major highway the QEW (Queen Elizabeth Way) means convenient (although sometimes extremely congested) access to Toronto and Burlington, as well as Hamilton. Ancaster is one of the oldest settlements in Ontario, but that does not mean it still retains its olde-worlde charm. Expect the sort of architecture and infrastructure of any town in Ontario: high-rise condo buildings, sprawling strip malls, and plenty of concrete. However, Ancaster is still a popular and convenient area, much like other towns surrounding Hamilton. With annual festivals including the regionally-famous Festival of Friends, and easy access to Hamilton’s downtown as well as GO transit links, Ancaster is worth looking into as a new home, particularly for anyone looking to settle with a family. 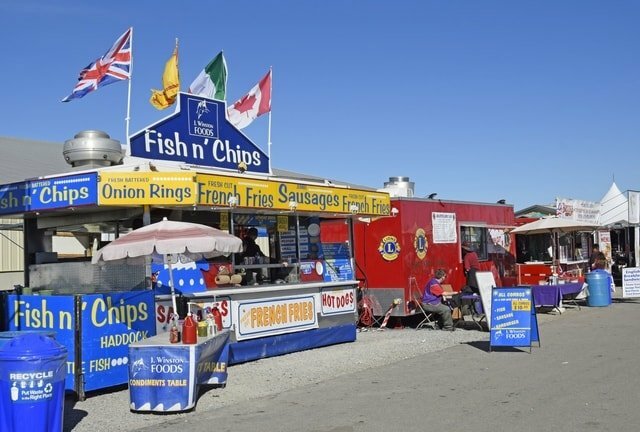 The Ancaster Fair is a favourite in the local calendar of events. This is a brief overview of just some Hamilton neighbourhoods. The choice of where to live is ultimately personal, but we hope this has given you some idea for where to start looking. If you have any tips or questions, please get in touch at [email protected] and we’ll include it in this page, if appropriate.